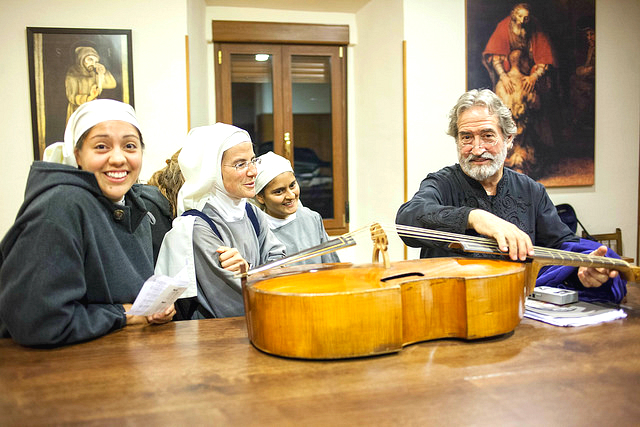 I’ve written in the past about early-music composer, conductor and multi-instrumentalist Jordi Savall. The guy is a prolific artist who has helmed an envious number of ensembles like Hespèrion XXI, La Capella Reial de Catalunya, and Les Concert des Nations. It wasn’t until I had a closer look at Savall’s discography this week that I realized just how big his recorded output is. From 1968 to 2015 Savall and his groups released 195 albums and eight film soundtracks. That’s 4.32 albums per year on average. But when you add in 22 compilation albums, and an additional 32 where Savall at least played on a selection of material, that’s 257 Savall-related releases over 47 years, or an insane 5.47 releases per year. Savall has gone on two especially hot publishing streaks thus far in his career. Between 1973 and 1978 (inclusive) he released an average of six albums per year, a pace that would put even some of history’s busiest recording artists (The Grateful Dead, Frank Zappa) to shame. However, what we might call “Peak Savall” in terms of album publishing came between 1992 and 2003. During that 12-year stretch Savall averaged a stunning 8.92 releases per year. Think about that for a minute. Peak Savall is explained by several admittedly speculative factors. First, there is a muscular output of original material (i.e. not previously released), good evidence we’re dealing with an artist at the height of his powers. What does that look like? The 1969-1970 five-album run of Creedence Clearwater Revival. Lil Wayne’s outrageous 2006 and 2007. Georg Philipp Telemann’s early Hamburg years. The music is flowing and the artist can’t get it out fast enough. Second, Peak Savall coincided with the CD’s rise to prominence. The compact disc offered expanded storage in an arguably superior sound environment, with nice profit margins to boot, and Savall had a wealth of projects in the pipeline to take advantage. Third, Savall was sufficiently advanced in his career such that new fans in the 1990s probably weren’t aware of his early work. Thus, reissues — with new packaging, better sound quality, and so on — were as good as brand-new releases, the second prong of a two-pronged attack (third if you count touring). With all this in mind, it’s clear that Savall and his ensembles deserve to be in the conversation for some of the most prolific recording artists in history. You can certainly argue for others: John Zorn, Buckethead, Sinatra, Elvis, noise artist Merzbow, etc. There is no consensus who holds the record. Late last month we were treated to a new Savall release called Granada Eterna 1013-1526. As the title suggests, Savall & co. have disentombed a wealth of material from the kingdom of Granada, and like so many of Savall’s projects, it’s an engrossing experience best listened to in a single, uninterrupted session. The album was recorded live at the Alhambra, the iconic palace and fortress in Granada. Granada Eterna is only (!) the second release for Savall this year, coming on the heels of Les Elements: Tempêtes, Orages & Fêtes Marines. If Savall’s historically great recording pace has slowed, his touring certainly has not: you can catch him and his band on one of 55 upcoming tour dates across multiple continents. > This article is adapted from a previous one featured in the twice-monthly CDA Mailer. To subscribe to the Mailer click here. Many thanks to Todd McComb at Medieval.org for the fantastic archive.